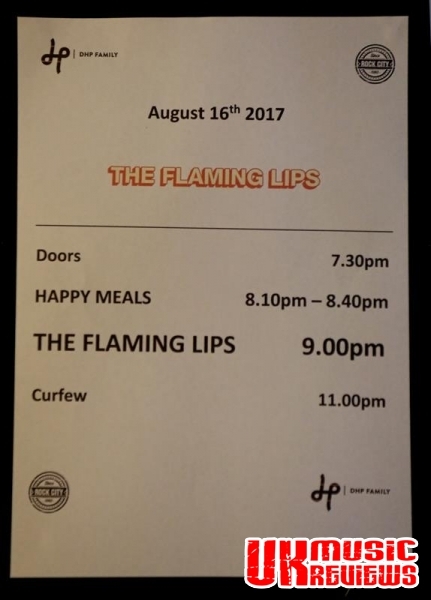 The Flaming Lips performing at Rock City Nottingham on Wednesday 16th August 2017. 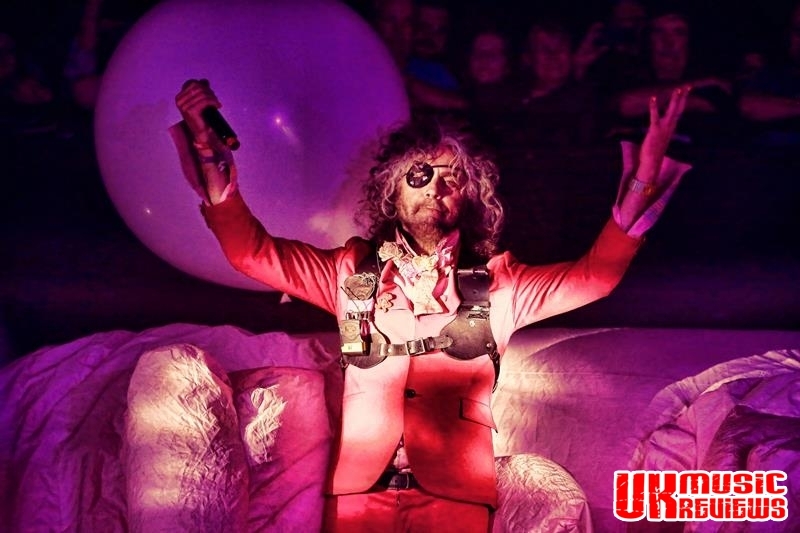 A sold out Rock City crowd were invited to The Flaming Lips greatest ever acid party last night and left at the end of the night with a big smile on their faces. Other than a few festival appearances over the years, this is a band that has been absent from the UK for some time, with the last tour of the country taking place in 2014. But boy, were they worth the wait. Having transformed Rock City into a psychedelic wonderland with its stage a visual masterpiece, bedecked with lasers, a curtain made of neon lights , several oversized inflatable props including a rainbow and a weird anthropomorphic sun, and a comically obscene greeting to Nottingham spelt out in silver blow up letters, which were released into the crowd, the tousle haired, eye patched captain of chaos better known as front man Wayne Coyne, took to the stage to a massive ovation and got the evening’s entertainment under way with Race For The Price. A huge inflatable pink robot towered over Coyne for Yoshimi Battles The Pink Robots Pt 1 as the serenely balmy song prompted a rapturous sing a long from a crowd who have clearly missed seeing the band in action. 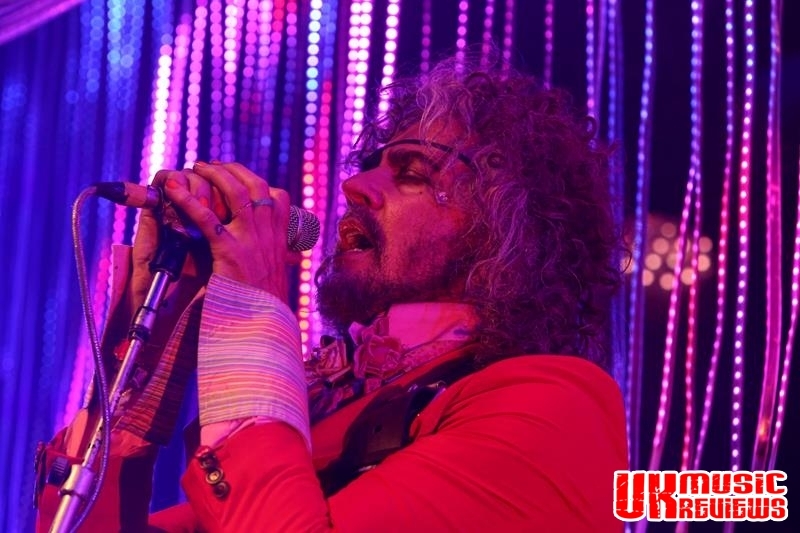 And whilst The Flaming Lips largely stuck to their older material, they did give an outing to three tracks from their latest album Oczy Mlody. 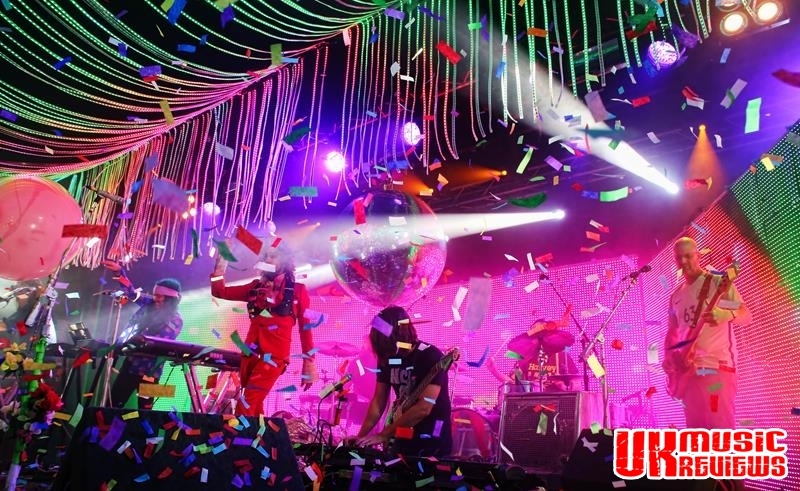 The first of the new songs saw Coyne leave the stage and with the band building up the groove to There Should Be Unicorns, he naturally re-appeared crossing the packed auditorium astride a mechanised inflatable unicorn while wearing a pair of angel wings and blasting glitter over the crowd from a massive confetti cannon. The whole concert was nothing more than psychedelic mayhem from the Oklahoma outfit who have built up a huge cult following. This is due in part that if you removed all of the props, you would still be left with double drums, keyboards, guitars, and bass from a really talented and tight knit band, and excellent vocals from a thoroughly entertaining front man. 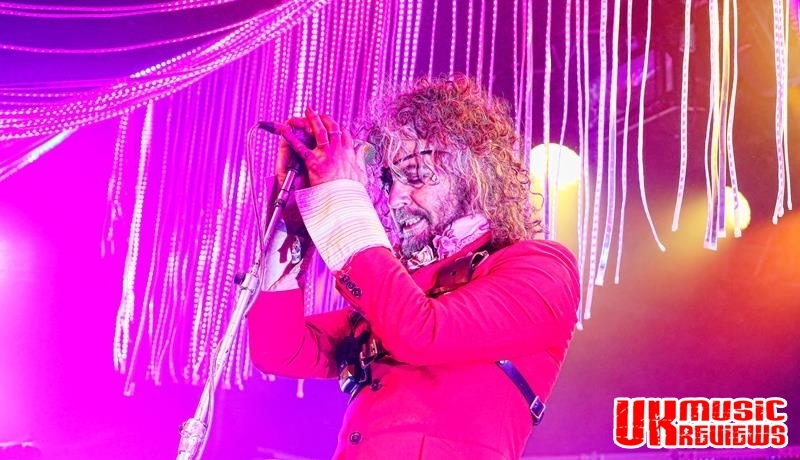 New song The Castle was downright serene as it continued with its wistful rhythms as it built up to a powerful crescendo, as dry ice filled the venue and Coyne’s high pitched, almost Neil Youngish vocals pulled the crowd in. During Pompeii Am Gotterdammerung Coyne bashed on a lit up gong and never kept still as Are You A Hypnotist? 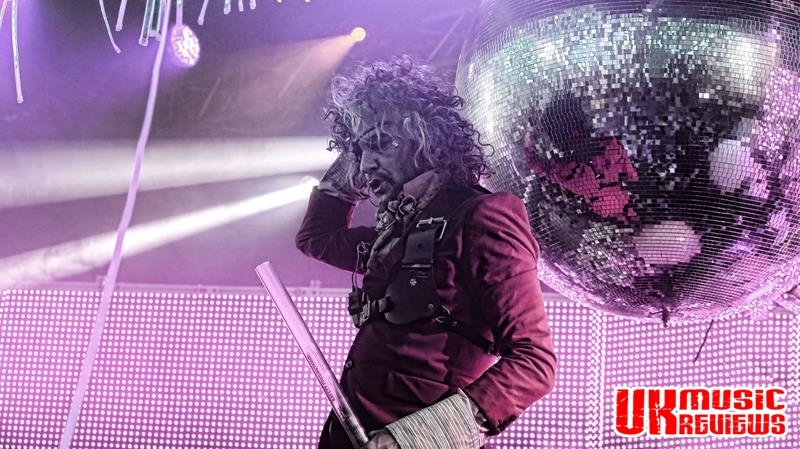 and The W.A.N.D showcased their psychedelic mixture of pop and electronica with hints of heavy metal, prog and some funk. A particular highlight was a near perfect version of David Bowie’s Space Oddity which Coyne performed from inside a human sized bubble which travelled across the crowd. Finishing off the evening with arguably their most popular track, Do You Realise? 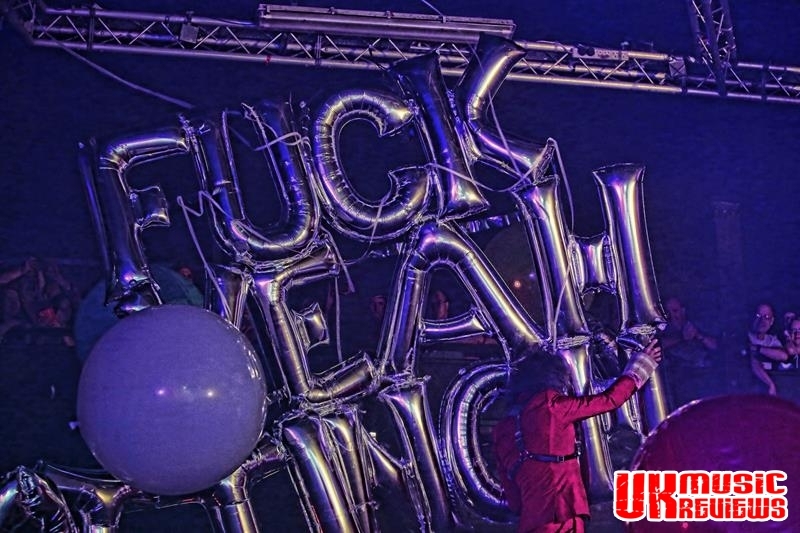 they proved just how entertaining they are, as their closer was performed under another big inflatable, this time a rainbow. 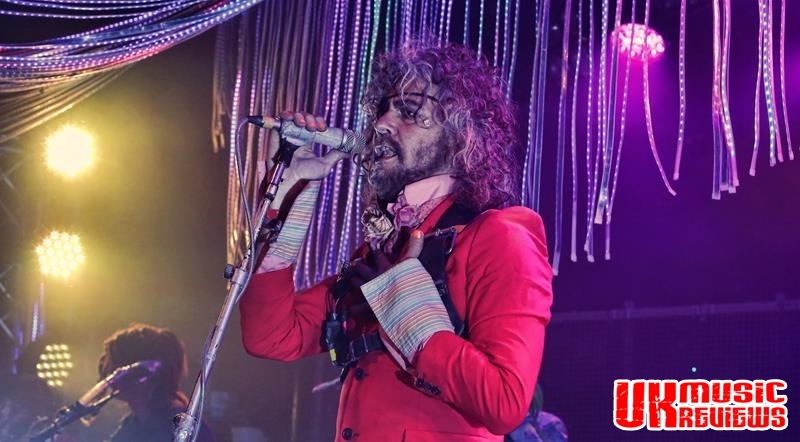 Whilst The Flaming Lips are most certainly a band to listen to, it is their stage show that elevates their concerts to a whole other level. With Rock City swathed in ticker-tape, it will be a long time until they see the likes of this concert again. And that is a real shame.